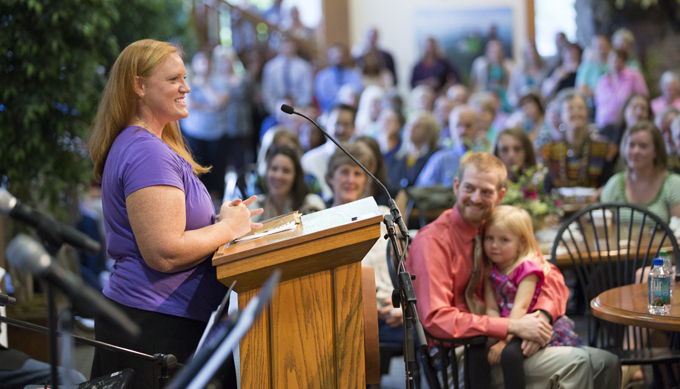 Amber Brantly thanks God and the Samaritan’s Purse staff for praying for her husband. Photos courtesy Samaritan’s Purse. 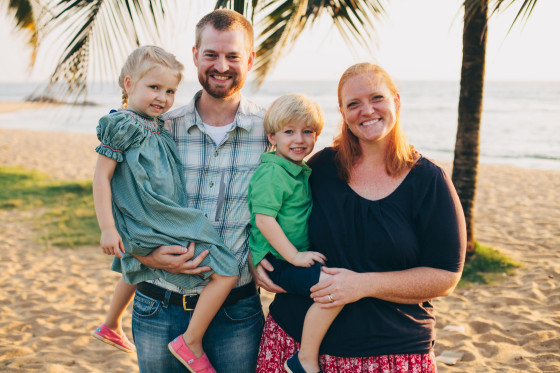 When Dr. Kent (’03) and Amber (Carroll ’06) Brantly accepted a call to the medical missions field in Liberia in 2013, they had no inkling their lives might one day be the making of international headlines. Those are questions the Brantlys still ask themselves as they attempt to raise awareness of the Ebola crisis in West Africa, now the deadliest on record. Kent and Amber Brantly with their two children. The couple had moved to Liberia as part of the World Medical Mission Post-Residency Program, an arm of Samaritan’s Purse, which aims to match a newly graduated doctor to a seasoned missionary doctor on the field for two years of mentoring. “When we were accepted to this program, we also met a physician working in Liberia and felt the Lord paired us together for this program and orchestrated the whole thing,” Amber said. Incidentally, that physician, Dr. Rick Sacra, is himself recovering from Ebola, as is their friend and colleague Nancy Writebol. That all three have survived a disease that has up to a 90 percent fatality rate is in itself remarkable. 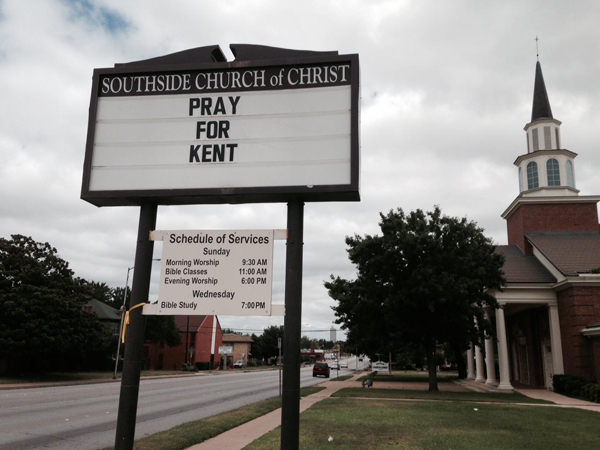 Millions have followed the story of Kent’s battle with Ebola and his amazing recovery. The experience has given the couple a platform to tell their story at the highest levels of government – including a private meeting with President Obama in the White House last month and two days of testimony before Congress on the Ebola crisis in West Africa. In their first public speaking engagement since their ordeal, the Brantlys will be on the Abilene Christian University campus during Homecoming weekend. They will speak jointly at a public event at 4 p.m. Oct. 10 in Moody Coliseum, sharing their story of faith and healing. Was the decision for you and Kent to stay in Liberia after the Ebola outbreak a difficult one to make? How did you navigate that decision? This is an interesting question to us. We didn’t really think about it. A disaster, a crisis had come to our home and the only thing we could do was respond. The Lord called us to Liberia clearly for “such a time as this,” and to abandon those we had come to serve during their time of need wasn’t an option. There was one day early in the outbreak when Kent spent over an hour deliberating whether it was safe for him to come home to us or not. He had seen a patient in the hospital with pretty typical symptoms: fever, headache, runny stomach. He sent him to the lab for a malaria test. But later in the day, he had a terrible sinking feeling. “What if this guy has Ebola, and I’ve missed it?” he wondered. He spent some time trying to find the man’s lab results, but the gentleman had not gone to the lab after all. He tried calling the phone number listed on the chart, but the line was dead (out of battery). He just couldn’t shake the feeling and the doubt he felt. After a long walk home and talking with his colleagues, he decided he could come home to us because even if he were exposed to the Ebola virus that day, he would not yet be contagious. You only become contagious when you have fever. The man came back the next day for his lab work, and he did not have Ebola; he had malaria. But I knew how much Kent carried the burden and the stress of his work home. Would you take us through those first few days when you found out that Kent had been infected with Ebola? 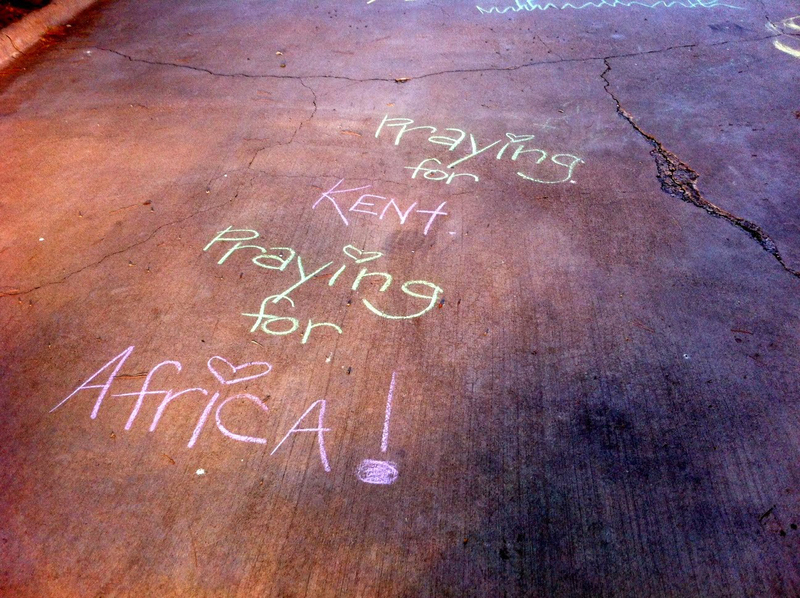 Prayers came in many forms while Kent battled Ebola. It was Thursday when Kent told me he was home sick with a fever. He had to remain isolated in our home until he had an Ebola test after 72 hours. So I waited. On Saturday morning they drew his blood and carried it to the national laboratory an hour down the road. I knew it would take several hours to run the test, so I tried to stay calm and carry out my regular activities. While I was a student at ACU, I spent Saturday mornings at my grandparents’ house for coffee. I wanted to go there this Saturday to carry on the tradition and take my kids over for a visit. My parents joined us, along with my aunt and a few of my siblings. I tried to engage that morning, but I was truly sick with worry. My parents were the only ones there who knew Kent was sick and the implications of what that would mean. I cried for a while alone in my room, then I texted my dad who was in another part of the house. “Daddy” is all I said. He and mom came and held me like a baby. I have never seen my dad cry like that. Somehow, undoubtedly empowered by the Holy Spirit, we made it through the next few days. The kids reminded us that they needed to eat. My heart was too sick to eat anything. I barely slept. We were surrounded by friends who brought us meals and drinks and provided a quiet home for the kids and me to stay in. You and the children had come to Abilene a few days earlier for your brother’s wedding. As a nurse, you knew the implications of this illness. What was your first thought when you received Kent’s phone call telling you he had tested positive for Ebola? Oh, no. This is awful. Please, Lord, give him strength to fight for his life. I need him. My kids need him. 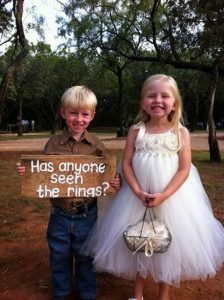 They need their daddy. How can I get to where he is so I can take care of him? What were those days like while you were waiting for news about Kent’s condition? Long. I was on pins and needles waiting for his calls, or a call from anybody in Liberia who could update me on his condition. The first call of the day was the most anticipated; I needed to know he survived the night. I started talking with people at Samaritan’s Purse about the possibility of evacuating Kent for care outside Liberia. That was a complicated process. Obviously, nobody had ever transferred an Ebola patient across international borders or oceans before. We met a lot of opposition and closed doors. I finally heard on Thursday, July 31, that Kent would be evacuated to Emory in Atlanta, and I was elated. I may never know or fully understand all the pieces that came together to make that happen, and that is OK, but I am forever grateful to Samaritan’s Purse, the U.S. State Department, and the private airline who agreed to fly Kent home for treatment. What kept you going? What helped you most throughout those days? Emails and messages from friends who did not ask for a reply, but just wrote to encourage me, including snippets of scriptures and hymns. I could barely come up with a prayer on my own, so to have Psalms sent to me that friends were praying for me was a big encouragement. You mentioned a desire to tell the “greater story” of what the Lord has done for you and Kent. Are there any moments when you were particularly aware of the Lord’s presence? Other than Kent’s surviving Ebola, my favorite part of the story is how the Lord worked in and through my children. From our coming to Texas from Liberia, they were covered in a shield that protected them from the trauma of the events of the week. They were flexible, oblivious, easily entertained, happy, cooperative, and all-around good. I have pretty good kids anyway, but this was a particular gift from the Lord that they were above and beyond well behaved. I left them with my sister-in-law for three whole weeks. I know the Lord was protecting them from harm, and that He was comforting me by caring for my children. Your children are so young now. When they grow up and hear the stories told about this time in your family’s life, what do you hope they will take from it? My prayer for my children is the same as it always was. I hope they can see how good and faithful the Lord is and that He will never stop loving us or give up on us. I pray that my children will love Him with their whole hearts, souls, minds and strength. What do the next few weeks – or months ­– hold for you and Kent? We honestly do not know. We plan to celebrate the upcoming holidays with our families, which is a surprising blessing since we thought we would be in Liberia for several years. We still plan on doing full-time career mission work, but we do not know where the Lord is calling us next. Kent is still physically recovering. His body took a big hit, but with a little work and exercise, he should be as healthy as he ever was. What, more than anything else, would you like people to know about this experience? I want people to know we are just regular folks seeking the Lord’s will for our lives. We only did what we felt He asked us to do, and because we had already died to ourselves in order to follow Him, we didn’t think much of it when he called us to Africa. The Lord has a calling on your life, too. I want people to know that when you seek the Lord’s will, obey Him and follow Him, He will always, always give you what you need to be faithful to Him. Hi I’m Molly Dixon and I am Kent’s cousin. I love how he survived through Ebola! Commendable as their story is, I have an issue with one oft-repeated statement: “You only become contagious when you have fever.” Firstly, I do not see such clear-cut statements in the medical literature. But secondly, even if it were so – there is a gaping hole in that logic: if you deal with people with weak immune systems (like many elderly) you may not have a fever response. Which is why screening people (only on arrival, to boot) for “fever” borders on gross negligence.